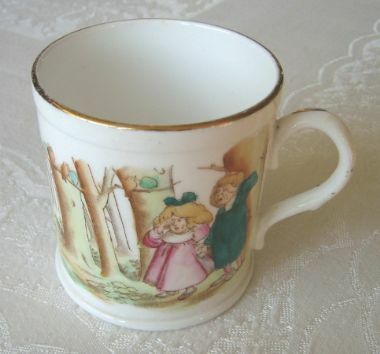 A charming original late Victorian or Edwardian antique "The Babes in the Wood" children's mug by Foley China (Wileman & Co.), with a large hand-coloured transfer picture to one side and a verse or rhyme beginning "The owls were trying hard to sing" to the other, together with gilt trim to the rim and handle. The base bears a green printed "THE FOLEY CHINA / ENGLAND" crown and monogram stamp (as used c.1895-1910), along with the printed registration number "397890" and a small painted "3". Although this genuine antique nursery ware mug shows some signs of age (see condition description below), together with minor manufacturing imperfections (including a small glazed nibble to the handle and various imperfections to the transfer) - and, as it predates present-day safety standards, is not recommended for use with food or drink, and especially not for use by children - it remains a delightful display piece, of interest to collectors of Foley China and childhood memorabilia alike.